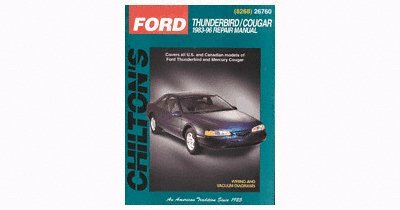 Product Description: Covers all models of Ford Thunderbird and mercury Cougar. This series offers do-it-yourselfers of all levels TOTAL maintenance, service, and repair information in an easy to use format. Each manual contains: trouble codes, electronic engine controls, maintenance schedules, diagnostic charts, wiring diagrams, tune up specifications, and much more.